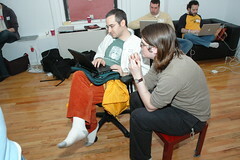 As I mentioned previously, I attended BarCampNYC this weekend and had a great time. I did two full presentations – both of which were quite successful. I started out with a quick overview of my company, Juniper Bay, what I do (programming, entrepreneur) and where I’m looking to go (have my own company running by the time I graduate). I then did a quick overview and demo of ideaShrub: Real-time Idea Collaboration. The web site managed to die while I was doing the demo, so that kind of fell through (unfortunately). ideaShrub is still in a closed beta, and I am still actively developing on it. I’m planning on making a public release ‘soon’. I then announced a brand new product: Feed Pile: Feed Sharing for Everyone. The premise for the site is very similar to SuprGlu, but is targeted more towards aggregating for your friends/clubs/family and sharing with them. It supports a bunch of neat features: No accounts, OPML, and Autodiscovery. It’s super-simple to use – give it a try! I gave this particular presentation with Eric Skiff – we were planning on giving similar presentations and decided to merge our efforts, to save time and effort. The reception to the talk seemed to be overwelmingly positive – and really opened the eyes of a lot of people. Eric released the source code to his MySpace Friends Adder, so if you’re interested in checking out some of the code, head on over there. Additionally, I’ve posted the slides that we used for the presentation. They may seem rather sparten – but that’s because we talked a lot more then we read. If you’re interested in the subject matter, feel free to comment or send us an email. Some people have posted photos of this particular presentation to Flickr, here’s one and another. Finally, I’d like to thank all the great people/companies that I got to know there: GlitchCast, SuprGlu, Simpy, Squidoo, Peter Nofelt, Good Experience, Bitty Browser, Joyent, Jolt, and HorsePigCow. Update: A basic outline for the presentation can be found on the BarCamp Wiki. Just wanted to say again how great it was to meet you and present together. I’ve been thinking a lot about jQuery and some of the projects you demoed. Drop me an email – there’s some interesting things brewing post barcamp. I missed all your presentations but the last one (Subverting Social Networks), and I quite liked what you and Eric presented. Very nice work. The numbers and percentages that Eric mentioned really surprised me. I think you brought the most, bestest new stuff to BarCampNYC. Thanks for a good recap and kudos on the cleanly designed new sites (to say nothing of the tech behind jQuery and Feed Pile). Did you do a websearch before decding name you script language “JQuery”? There are in fact already two other thing that are called JQuery out there. One of them is a Java code browser built by me and my students as an Eclipse plugin. Just though I’d mention it. I don’t really have any claim to the name so you are welcome to use it but maybe you want to use a name that is more unique? Hi Kris – I was, originally, going to use JSelect, but all the domain names were taken already. I then did a search before I decided to call the project jQuery, saw your project, and also saw that it hadn’t been updated since “October 26, 2004: JQuery 3.1.3”. So, I assumed it was defunct. Ironically, it appears as if you’ve started development on it, again – once again causing a clash in names. Thanks for the reply. I guess we’ll share the name. You are right JQuery (the browser) is “dormant” I only spent a minimal effort on making it run under the latest version of Eclipse. However, I certainly don’t consider it “defunct” just yet even though development on it is minimal. Anyhow… it looks like your jQuery script library is catching on in popularity. Congrats! Looks like a cool piece of work.